In a previous post I proposed that Duterte might be waking up to the very real threat ISIS poses to the Philippines. It looks like I was wrong. The Bohol fighting between government troops and suspected Abu Sayyaf men erupted on Tuesday a day after Armed Forces Chief Eduardo Año said that the military did not see any terror threat in the Philippines despite the recent warning by the US Embassy in Manila to Americans to avoid going to Central Visayas. “We have to be vigilant. We would like to encourage the public to report suspicious people, suspicious objects or circumstances so the AFP (Armed Forces of the Philippines) can take immediate, fast counter actions,” Año told reporters during a pre-departure press briefing of President Duterte at the Davao International Airport on Monday. “But right now, we don’t see any terror threat,” the military chief added. President Duterte likewise downplayed the US travel warning, saying the government could handle any terror threats. “Kaya natin ang threat of terrorism. Why should you worry about the (US) embassy? I should be worrying about my country, not the (American embassy),” the President said. In its travel advisory on Sunday, the US Embassy cautioned Americans against traveling to tourist resorts in Cebu and Bohol in Central Visayas, citing “unsubstantiated yet credible information” that terrorists might kidnap foreigners there. 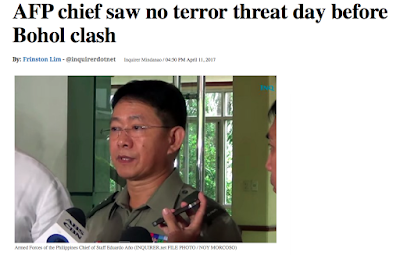 How is it that neither the chief of the armed forces nor Duterte didn't "see any terror threat" when both the US Embassy and the chief of the PNP confirmed that there is a threat? The Philippine Army has an intel problem. They cant even see what is so plain to the entire world. How can Duterte be so blithe regarding the threat warning issued by the US embassy? "Why should you worry about the (US) embassy? I should be worrying about my country, not the (American embassy),” the President said." He should be worrying about his country. He should be worrying about the threat that ISIS poses to the stability of his country. When the US Embassy issues a threat warning he should not brush it off as being of no substance. With information drawn from the CIA, the NSA, and numerous other black-ops organisations US intel is highly reliable. 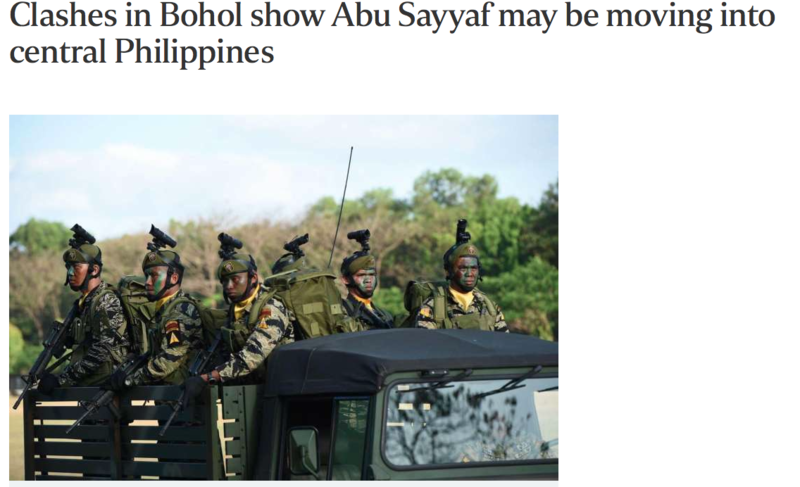 It's not just the US embassy that recognises the threat ISIS poses to the Central Visayas. In 2014 Barack Obama made the grave mistake of underestimating ISIS as the JV team but he was wrong as they have proven to be resilient and effective killers. They have stated their goals for all to see. ISIS is in the Philippines and they are not going away. Until the president and the army take their heads out of the sand this threat will continue to grow. They won't stop until they are dead or they have won. Send the whole army into Mindanao and destroy them all before it's too late. Listen, and understand. ISIS is out there. They can’t be bargained with. They can’t be reasoned with. They don’t feel pity, or remorse, or fear. And they absolutely will not stop, ever, until you are dead.